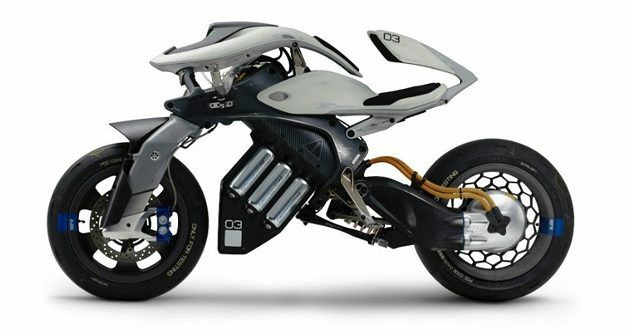 Yamaha teased the Motoroid, its futuristic self balancing motorcycle at the Bangkok International Motor Show this week. The Motoroid uses Artificial Intelligence to interact with its riders and is described as the future of motorcycling by the Japanese firm. “The motorbike is the recent past, and the Motoroid is the future,” Yamaha spokesman John Boreland said recently. The Motoroid boasts a number of autonomous features such as being able to recognise riders, being summoned with a wave and balancing on its own. Fitted with cameras, the Motoroid can be summoned by the rider with a gesture, while it can also learn to follow its ‘master’ at a slow pace via its facial recognition technology. Its radical race inspired design includes three battery cells in what looks like chrome canisters just beneath the seat. Speaking of its seat, Yamaha says the one included on the Motoroid has been specially designed by a psychologist to gently squeeze the lower back of the rider in order to give them a reassuring caress as they travel at high speeds. The Motoroid is just a concept at the moment and it may be some time before you see one weaving in and out of Bangkok traffic. Here it is on show in Tokyo last year.